On August 17th, 2017, the “Visual Health Precision Anti-Poverty Operation” project was inaugurated in Beijing. 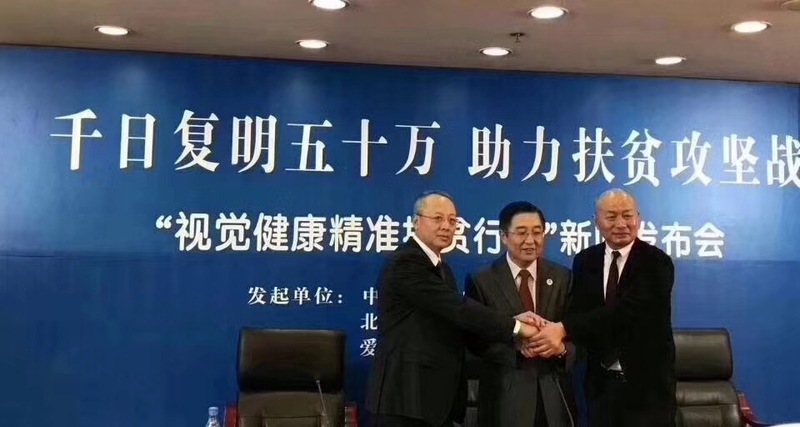 This is a joint initiative strated by All-China Federation of Returned Overseas Chinese (ACFROC), Oversea Chinese Charity Foundation of China (OCCFC), Beijing QFund network Technology Co., Ltd and AIER Eye Hospital Group Co., Ltd. The project advocates immediate action in the entire society to provide 500,000 impoverished patients with free, precise, and high-quality eye care medical services to restore eye health within three years. In 2016, the data issued by National Health and Family Planning Commission indicate that, according to the statistics by the Poverty Alleviation Office of State Council of China, 42% of impoverished households are due to illness. Recurrent impoverishment caused by illness has been the biggest challenge in solving poverty. According to Mr. Wei Qiao, the vice chairman of ACFROC (also the Chairman of OCCFC), there are 43 million impoverished people in China and about 0.6-0.7 million of them haveIt is reported that the screening and treatment of impoverish patients will be launched through more than 180 AIER Eye Hospitals in 30 provinces and municipalities. At the same time, the specific fundraising projects and schemes will be publicly listed and launched on the online fundraising platform "QFund" selected by the ministry of civil affairs. The ACFROC will support and participate in the charity project through the nationwide overseas Chinese federation system to widely mobilize domestic relatives of overseas Chinese, overseas Chinese and various social organizations joining in. "Visual Health Precise Anti-Poverty Operation" will be partially covered by basic medical insurance, the rest out-of-pocket expenses will be covered by funds raised from all kinds of charitable channels, thus the patients don’t need to worry about the cost. "The project reflects the new thinking of health-related poverty alleviation, which is a beneficial practice of the country's strategy of precise poverty alleviation and health poverty alleviation" said by Mr. Bang Chen, the chairman of AIER Eye Hospital Group. He also guaranteed that AIER will organize a professional and highly capable medical team to provide services to impoverished patients all around the country, as well as cash, drugs, equipment, professional and technical personnel and other supporting resources worth 100 million RMB.